Thomas William Hammond - The sandstone hills of Nottingham - Online gallery supplying original fine art. Trending Modern British and Contemporary Welsh. Available for sale from Big Sky Fine Art; this original pastel on paper by Thomas William Hammond; dating from the turn of the century.<br> The work is presented and supplied in its original frame and 1950s mount. The frame has been opened and the artwork mounted with a barrier of conservation materials and retains the original glass.<br> <br> The life of Thomas Hammond is an extraordinary one, he was an orphan who was shipped to another continent to be brought up in his parents’ home town, and went on to become one of the town’s best loved sons.<br> <br> Hammond’s parents were William Hammond and Maria Gee. They married in 1852 and emigrated to Philadelphia. They had three children; Joseph, Thomas and Maria. In 1859 after his elder brother and both parents had died, Thomas and his younger sister were sent back to England to live with their grandparents. Thomas was just four at the time. For a while they lived at Mount Street in Nottingham. <br> <br> In 1868 age 14 the young Thomas enrolled in the Government School of Art. Nottingham was at that time the center of a thriving lace industry and Thomas began to work as a designer, where his talents began to shine. On the 1871 census he is described as a lace curtain designer, and in 1872 he was awarded the 'Queen's Prize for a Design of a Lace Curtain'. Other prizes followed and in 1877 he was again awarded the Queen's Prize, this time for the design for a damask table Cloth.<br> <br> Thomas married Eleanor Maud Kearne and they had two children, Cecil and Guy. They lived at 9 Burns Street, Nottingham.<br> <br> Hammond was an indefatigable worker, and soon began to use his skills as a draftsman to record aspects of the changing town. In his spare time he sketched the rapidly changing landscape of Nottingham. He was unique in that he focused on the one town, and worked with a sense of mission, recording every view and aspect of its life. He worked mainly in pastels and charcoal. He began showing his work at local venues in 1882 and in 1890 exhibited for the first time at the Royal Academy. He is thought to have produced around 350 pictures altogether, and together they form one of the best records of the still largely Georgian and Victorian town. <br> He died on 9th February 1935 and is buried at Wilford Church, Nottingham.<br> <br> For a while Hammond was one of Nottingham greatest and best loved artists, but today his work is underappreciated and, according to a prominent local patron today, his accomplished work is absurdly inexpensive. <br> <br> This original pastel shows a rural view of Victorian Nottingham. To the foreground we see flat fields, scattered with wild flowers, and figures, possibly, workers in the distance. There is a rough path leading the eye to the distant city in the background. The sandstone cliffs, upon which the city stands are visible, with the outline of buildings. To the left are deep green hills, to the right a couple of native trees. There is an extensive sky, with heavy rolling clouds against the pale blue of the sky. Overall, the effect is composed and pleasant. Available for sale from Big Sky Fine Art; this original pastel on paper by Thomas William Hammond; dating from the turn of the century. The work is presented and supplied in its original frame and 1950s mount. The frame has been opened and the artwork mounted with a barrier of conservation materials and retains the original glass. The life of Thomas Hammond is an extraordinary one, he was an orphan who was shipped to another continent to be brought up in his parents’ home town, and went on to become one of the town’s best loved sons. Hammond’s parents were William Hammond and Maria Gee. They married in 1852 and emigrated to Philadelphia. They had three children; Joseph, Thomas and Maria. In 1859 after his elder brother and both parents had died, Thomas and his younger sister were sent back to England to live with their grandparents. Thomas was just four at the time. For a while they lived at Mount Street in Nottingham. In 1868 age 14 the young Thomas enrolled in the Government School of Art. Nottingham was at that time the center of a thriving lace industry and Thomas began to work as a designer, where his talents began to shine. On the 1871 census he is described as a lace curtain designer, and in 1872 he was awarded the 'Queen's Prize for a Design of a Lace Curtain'. Other prizes followed and in 1877 he was again awarded the Queen's Prize, this time for the design for a damask table Cloth. Thomas married Eleanor Maud Kearne and they had two children, Cecil and Guy. They lived at 9 Burns Street, Nottingham. Hammond was an indefatigable worker, and soon began to use his skills as a draftsman to record aspects of the changing town. In his spare time he sketched the rapidly changing landscape of Nottingham. He was unique in that he focused on the one town, and worked with a sense of mission, recording every view and aspect of its life. He worked mainly in pastels and charcoal. 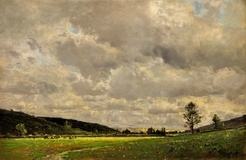 He began showing his work at local venues in 1882 and in 1890 exhibited for the first time at the Royal Academy. He is thought to have produced around 350 pictures altogether, and together they form one of the best records of the still largely Georgian and Victorian town. He died on 9th February 1935 and is buried at Wilford Church, Nottingham. For a while Hammond was one of Nottingham greatest and best loved artists, but today his work is underappreciated and, according to a prominent local patron today, his accomplished work is absurdly inexpensive. This original pastel shows a rural view of Victorian Nottingham. To the foreground we see flat fields, scattered with wild flowers, and figures, possibly, workers in the distance. There is a rough path leading the eye to the distant city in the background. The sandstone cliffs, upon which the city stands are visible, with the outline of buildings. To the left are deep green hills, to the right a couple of native trees. There is an extensive sky, with heavy rolling clouds against the pale blue of the sky. Overall, the effect is composed and pleasant.